A hearty gift to convey your kind sentiment to those who have fallen under the weather. Woodcott Spring Desert Blackseed Honey 180g, Woodcott Carob Honey 180g and 5 types of freshly selected fruits. Complemented with a pot of cheery Stargazer Lilies. As only the freshest fruits and are used for all our fruit arrangements, the types of fruits may be subjected to change. 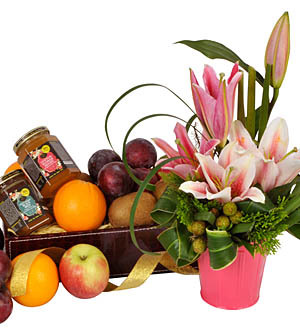 Fruits and honey gift are ideal as a Get Well Gift, for new Mother or as a 'Thank You' Gift.